Eric Fèvre gives Sir Mark Walport, UK chief scientific adviser, an overview of his UK-Kenya livestock and human health projects (photo credit: ILRI/Susan MacMillan). 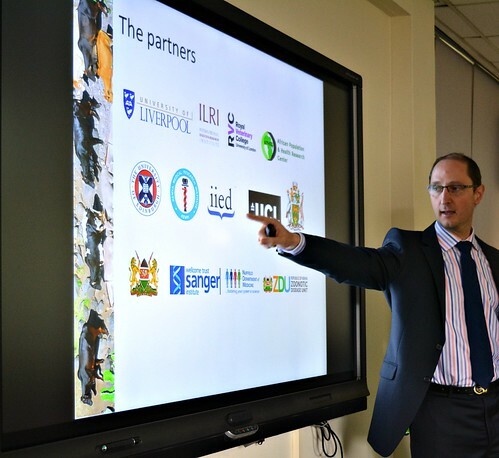 The first scientist of two scientists to make a short presentation to Sir Mark Walport, the UK chief scientific adviser, on his 15 Jul 2015 visit to the International Livestock Research Institute (ILRI), in Nairobi, Kenya, was Eric Fèvre, a veterinary epidemiologist and joint appointee at ILRI and the Institute of Infection and Global Health at the University of Liverpool. Fèvre manages several field-oriented research projects on neglected zoonoses on behalf of the CGIAR Research Program on Agriculture for Nutrition and Health.